SAVE THE DATE FOR A NIGHT AT THE MUSEUM – 18 OCTOBER 2018! 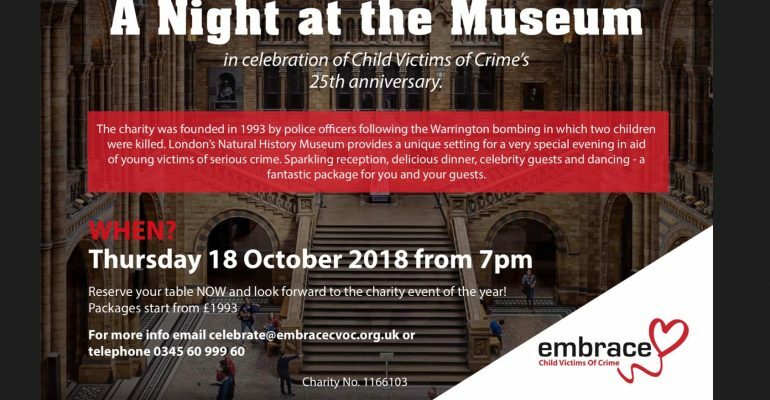 This year is the 25th anniversary of the founding of Embrace Child Victims of Crime and the charity is planning a spectacular event to mark this special occasion. You won’t want to miss joining us for an unforgettable ‘Night at the Museum’! This year’s event will be a celebration of our ‘Silver’ anniversary. We will be be joined by many of our key supporters, past and present, along with those who have played a significant part in our history. Our 25th Anniversary Gala Dinner will be held on Thursday 18 October at The Natural History Museum, Kensington, London, starting at 7pm. We are now selling tables of ten for an ‘anniversary’ price of £1993 to include a sparkling reception, three-course dinner, half bottle of wine per person and a full programme of entertainment including a celebrity guest speaker. This year we are also offering a special package for those companies who want their guests to enjoy a little extra luxury (includes all drinks consumed during the evening) at £2,500 per table of ten. This will include two bottles of Champagne at the table and a premium spot at the venue. Sponsorship packages are also available and include opportunities for your company to play a high-profile role during the evening. Please email celebrate@embracecvoc.org.uk to reserve your table today or for more information. We look forward to celebrating our quarter century of success with you! Magical memories made this summer for families affected by serious crime.